Please choose the options: Door hanger type, size, quantity, extras, double or single sided, to get an instant price. If you can't find what you are after you can click here to contact us or click here submit a quote request. 310gsm is our cheapest yet high-quality uncoated paper stock. 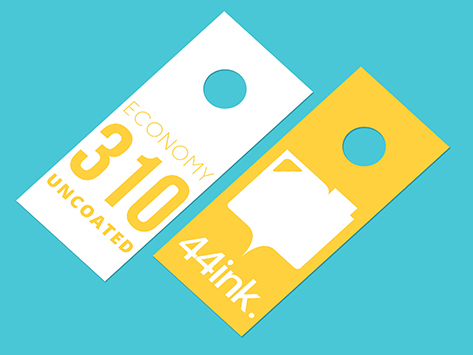 The uncoated stock will make your door hanger smooth and have a fine surface. Best for prints that have a lot of text or reading materials, best for smudge-less writing. Door hangers are very effective form of direct marketing for and established businesses. They're simple, easy to distribute, easy to notice, and cost effective. With our bookmark, you can build name and brand recognition for your company. paper stock for more impact to your door hanger. We deliver around Northern beaches, Manly, Dee Why, Brookvale, and also anywhere else in Australia with 3 - 5 days fast turn around.